Popular – scientific anthology “Zemlja i ljudi” (English: Earth and people) is continuously published since 1951. In an effort to popularize geographical science among readers of different education, but joint geographical interest, this book offers them the opportunity to meet both spatially close and remote areas and their inhabitants, all through the written word and the finest photographs, for decades now. Pages of this specific format publication, filled with interesting and instructive texts, with review and travelogue type, make even the farthest horizons close to their readers, as well as the work and discoveries of prominent researchers and scientists of geographical thought. 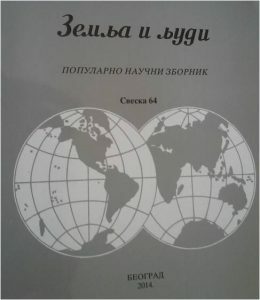 In 58 editions, which are published so far, you can see the authors’ impact of renowned university professors, teachers of geography which lead their students to the treasury of geographical knowledge in primary and secondary education, and impact of talented students of geography. The journal is published once a year. This way, Editorial anthology of “Zemlja i ljudi” magazine refers to an open invitation for cooperation with new generations of authors and readers. Editorial of journal “Zemlja i ljudi” refers in this way an open invitation for cooperation to the new generations of authors and readers.